The Self-Care Starter Kit is a great option for self-motivated, independent learners who prefer to explore the 8 Dimensions of Self-Care at their own pace. The kit includes a 40-page workbook with self-care tips and worksheets, eight training videos, two eBooks — PLUS a few sample pages from The Self-Care Planner! If you want to experience more joy (and save a little jingle on healthcare), this is a great place to start developing your self-care plan. 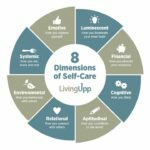 The Living Upp 8-Day Self-Care Challenge is an 8-video training series that leads you through the 8 Dimensions of Self-Care and helps you begin experimenting with new self-care strategies so you can identify which ones best support and strengthen you. A digital copy of the eBook Uppward: A Self-Care System for Purposeful Living provides additional background and an overview of the 8 Dimensions of Self-Care. Gain a deeper understanding of each dimension and how it applies to your life personally. A Self-Care Assessment, which walks you through the “rate your 8” process and helps you identify which of the dimensions you’re supporting well and which ones need your attention. A Self-Care Activity List with over 300 ideas to help you explore new ways to care for yourself. A Self-Care Plan Template, where you can begin mapping out your personalized self-care plan and ensure that it supports each of the 8 dimensions. Plus, a number of Worksheets to help you begin envisioning the life you want to create. As a bonus, you’ll receive a digital copy of My Year of Self-Care, a 284-page eBook that shows you how to experiment with self-care for an entire year. Be honest. Have you been neglecting yourself? The problem is that when we neglect ourselves — working long hours without breaks, skipping meals, solving other people’s problems, sacrificing sleep — just to keep our heads above water, we end up exhausted, malnourished, grumpy, and sometimes even sick. And those aren’t exactly the qualities you’re after if what you really want is to be in service to others, feel a sense of balance, and experience more joy. Now, imagine yourself at your best. When your daughter comes in screaming that she hates her pants, or your dog pukes on the rug, or your boss proposes a dumb new project, you don’t lose your mind. Instead, you can take a deep breath and effortlessly solve the pants problem, wash the rug (because, let’s face it, it probably needed washed anyway), and bring a list of well-thought-out suggestions to your boss so the project is more manageable and successful. Plus, you’re just more fun to be around. The Self-Care Starter Kit is designed to help you focus your time and energy on what matters most, so you can live a life you love. Ready to completely redesign your life? Yes, I want the Starter Kit! Upgrade now and join the Lifestyle Design Studio here.